Download "Workers Compensation: Commutation of Future Benefits"
1 July 23, 2001 To: From: SUBJECT: All Associate Regional Administrators Attention: Division of Medicare Deputy Director Purchasing Policy Group Center for Medicare Management Workers Compensation: Commutation of Future Benefits Medicare s regulations (42 CFR ) and manuals (MIM & and MCM & ) make a distinction between lump sum settlements that are commutations of future benefits and those that are due to a compromise between the Workers' Compensation (WC) carrier and the injured individual. This Regional Office letter clarifies the Centers for Medicare & Medicaid Services (CMS) policy regarding a number of questions raised recently by several Regional Offices (RO) concerning how the RO should evaluate and approve WC lump sum settlements to help ensure that Medicare s interests are properly considered. Regional Office staff may choose to consult with the Regional Office s Office of the General Counsel (OGC) on WC cases because these cases may entail many legal questions. OGC should become involved in WC cases if there are legal issues which need to be evaluated or if there is a request to compromise Medicare s recovery claim or if the Federal Claims Collection Act (FCCA) delegations require such consultation. 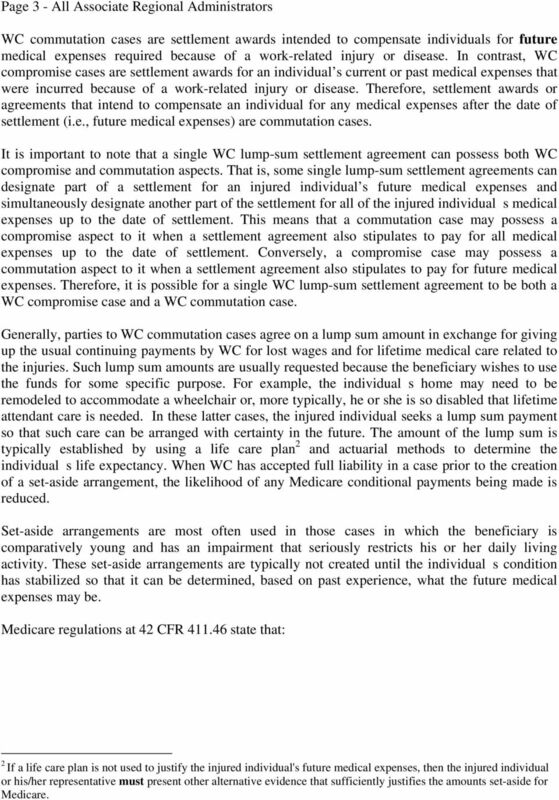 Because most WC carriers typically dispute liability in WC compromise cases, it is very common that Medicare later finds that it has already made conditional payments. (A conditional payment means a Medicare payment for which another payer is responsible.) If Medicare s conditional payments are more than $100,000 and the beneficiary also wishes Medicare to compromise its recovery under FCCA (31 U.S.C. 3711), the case must be referred to Central Office and then forwarded to the Department of Justice. 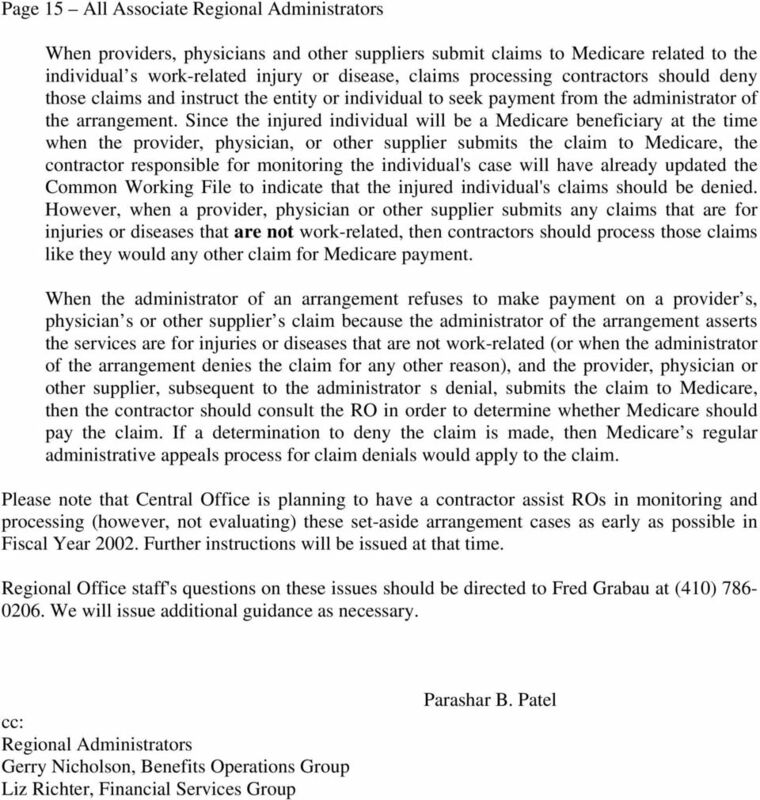 It is important to note in all WC compromise cases that all pre-settlement and post-settlement requests to compromise any Medicare recovery claim amounts must be submitted to the RO for appropriate action. Regional Offices must comply with general CMS rules regarding collection of debts (please reference the Administrator's March 27, 2000 memo re: New instructions detailing your responsibilities for monies owed to the government). Medicare is secondary payer to WC, therefore, it is in Medicare's best interests to learn the existence of WC situations as soon as possible in order to avoid making mistaken payments. The use of administrative mechanisms 1 sometimes referred to by attorneys as Medicare Set-Aside Trusts (hereafter referred to as "set-aside arrangements") in WC 1 Although 42 CFR requires that all WC settlements must adequately consider Medicare's interests, 42 CFR does not mandate what particular type of administrative mechanism should be used to set-aside monies for Medicare including a self-administered arrangement (State law permitting). Of course, if an arrangement is selfadministered, then the injured individual/beneficiary must adhere to the same rules/requirements as any other administrator of a set-aside arrangement. 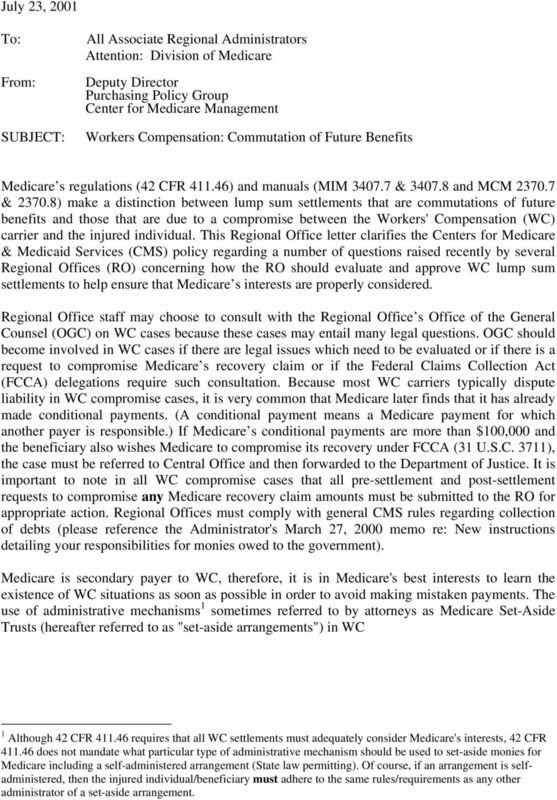 2 Page 2 All Associate Regional Administrators commutation cases enables Medicare to identify WC situations that would otherwise go unnoticed, which in turn prevents Medicare from making mistaken payments. Set-aside arrangements are used in WC commutation cases, where an injured individual is disabled by the event for which WC is making payment, but the individual will not become entitled to Medicare until some time after the WC settlement is made. Medicare learns of the existence of a primary payer (WC) as soon as possible when Medicare reviews a proposed setaside arrangement at or about the time of WC settlement. In such cases, Medicare greatly increases the likelihood that no Medicare payment is made until the set-aside arrangement's funds are depleted. These set-aside arrangements provide both Medicare and its beneficiaries security with regard to the amount that is to be used to pay for an individual's disability related expenses. It is important to note that set-aside arrangements are only used in WC cases that possess a commutation aspect; they are not used in WC cases that are strictly or solely compromise cases. Lump sum compromise settlements represent an agreement between the WC carrier and the injured individual to accept less than the injured individual would have received if he or she had received full reimbursement for lost wages and life long medical treatment for the injury or illness. 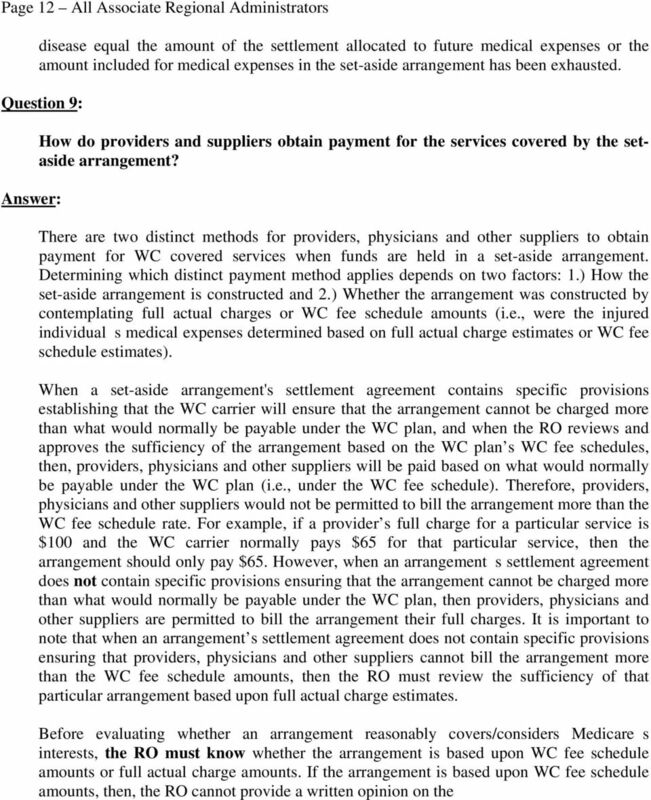 In a typical lump sum compromise case between a WC carrier and an injured individual, the WC carrier strongly disputes liability and usually will not have voluntarily paid for all the medical bills relating to the accident. Generally, settlement offers in these cases are relatively low and allocations for income replacement and medical costs may not be disaggregated. Such agreements, rather than being based on a purely mathematical computation, are based on other factors. These may include whether there was a preexisting condition, whether the accident was really work related, or whether the individual was acting as an employee, or performing workrelated duties at the time the accident occurred. One of the distinctions that Medicare s regulations and manuals make between compromise and commutation cases is the absence of controversy over whether a WC carrier is liable to make payments. 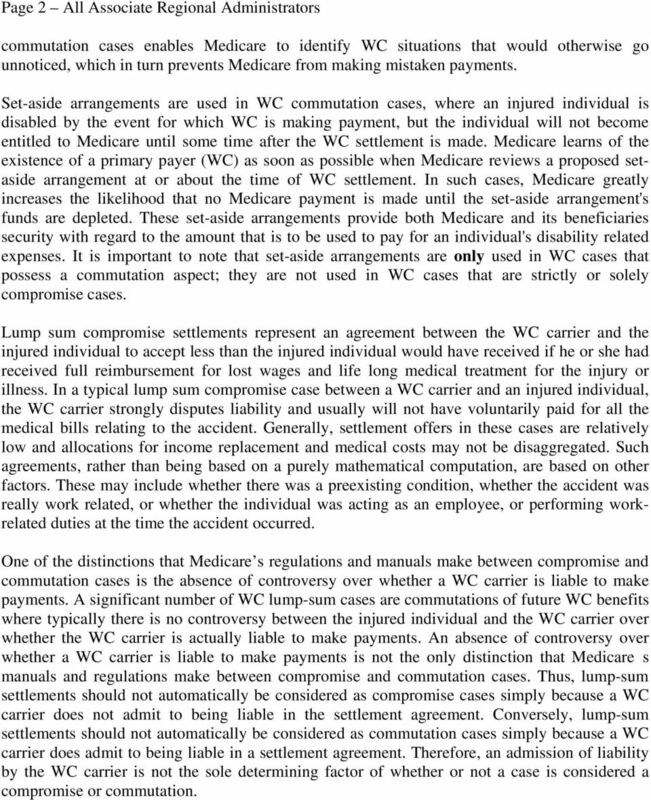 A significant number of WC lump-sum cases are commutations of future WC benefits where typically there is no controversy between the injured individual and the WC carrier over whether the WC carrier is actually liable to make payments. An absence of controversy over whether a WC carrier is liable to make payments is not the only distinction that Medicares manuals and regulations make between compromise and commutation cases. Thus, lump-sum settlements should not automatically be considered as compromise cases simply because a WC carrier does not admit to being liable in the settlement agreement. Conversely, lump-sum settlements should not automatically be considered as commutation cases simply because a WC carrier does admit to being liable in a settlement agreement. Therefore, an admission of liability by the WC carrier is not the sole determining factor of whether or not a case is considered a compromise or commutation. 3 Page 3 - All Associate Regional Administrators WC commutation cases are settlement awards intended to compensate individuals for future medical expenses required because of a work-related injury or disease. In contrast, WC compromise cases are settlement awards for an individual s current or past medical expenses that were incurred because of a work-related injury or disease. Therefore, settlement awards or agreements that intend to compensate an individual for any medical expenses after the date of settlement (i.e., future medical expenses) are commutation cases. It is important to note that a single WC lump-sum settlement agreement can possess both WC compromise and commutation aspects. That is, some single lump-sum settlement agreements can designate part of a settlement for an injured individual s future medical expenses and simultaneously designate another part of the settlement for all of the injured individuals medical expenses up to the date of settlement. This means that a commutation case may possess a compromise aspect to it when a settlement agreement also stipulates to pay for all medical expenses up to the date of settlement. Conversely, a compromise case may possess a commutation aspect to it when a settlement agreement also stipulates to pay for future medical expenses. Therefore, it is possible for a single WC lump-sum settlement agreement to be both a WC compromise case and a WC commutation case. Generally, parties to WC commutation cases agree on a lump sum amount in exchange for giving up the usual continuing payments by WC for lost wages and for lifetime medical care related to the injuries. Such lump sum amounts are usually requested because the beneficiary wishes to use the funds for some specific purpose. For example, the individuals home may need to be remodeled to accommodate a wheelchair or, more typically, he or she is so disabled that lifetime attendant care is needed. In these latter cases, the injured individual seeks a lump sum payment so that such care can be arranged with certainty in the future. The amount of the lump sum is typically established by using a life care plan 2 and actuarial methods to determine the individuals life expectancy. When WC has accepted full liability in a case prior to the creation of a set-aside arrangement, the likelihood of any Medicare conditional payments being made is reduced. Set-aside arrangements are most often used in those cases in which the beneficiary is comparatively young and has an impairment that seriously restricts his or her daily living activity. These set-aside arrangements are typically not created until the individuals condition has stabilized so that it can be determined, based on past experience, what the future medical expenses may be. Medicare regulations at 42 CFR state that: 2 If a life care plan is not used to justify the injured individual's future medical expenses, then the injured individual or his/her representative must present other alternative evidence that sufficiently justifies the amounts set-aside for Medicare. 5 to the extent of Medicare s interests in the lump sum payment per 42 CFR or a setaside arrangement that adequately considers Medicares interests in the lump sum payment. 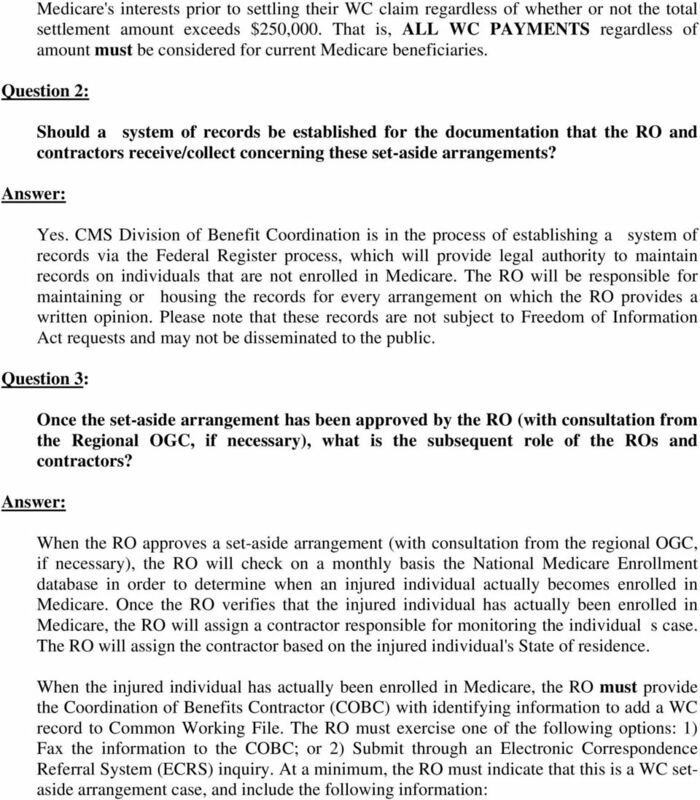 The answer to Question 1(b) is that the RO (with consultation from the Regional OGC, if necessary) can review a proposed settlement including a set-aside arrangement and can give a written opinion on which the potential beneficiary and the attorney can rely, regarding whether the WC settlement has adequately considered Medicares interests per 42 CFR These settlements should all be handled on a case-by-case basis, as each situation is different. If there are several years prior to Medicare entitlement, the RO should use its best judgment regarding what Medicare utilization might be once there is Medicare entitlement. This decision should be based on the documentation obtained as stated in the answer to Question 10. Once the RO has given written assurance that the set-aside arrangement is sufficient to satisfy the requirements at 42 CFR , when the set-aside arrangement is established and the settlement is approved, the RO should then set up a procedure to follow the case. 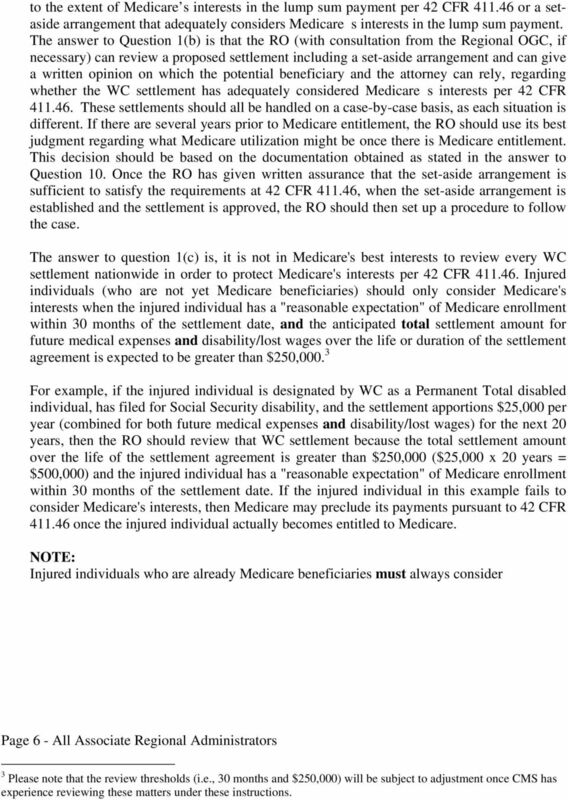 The answer to question 1(c) is, it is not in Medicare's best interests to review every WC settlement nationwide in order to protect Medicare's interests per 42 CFR Injured individuals (who are not yet Medicare beneficiaries) should only consider Medicare's interests when the injured individual has a "reasonable expectation" of Medicare enrollment within 30 months of the settlement date, and the anticipated total settlement amount for future medical expenses and disability/lost wages over the life or duration of the settlement agreement is expected to be greater than $250, For example, if the injured individual is designated by WC as a Permanent Total disabled individual, has filed for Social Security disability, and the settlement apportions $25,000 per year (combined for both future medical expenses and disability/lost wages) for the next 20 years, then the RO should review that WC settlement because the total settlement amount over the life of the settlement agreement is greater than $250,000 ($25,000 x 20 years = $500,000) and the injured individual has a "reasonable expectation" of Medicare enrollment within 30 months of the settlement date. If the injured individual in this example fails to consider Medicare's interests, then Medicare may preclude its payments pursuant to 42 CFR once the injured individual actually becomes entitled to Medicare. 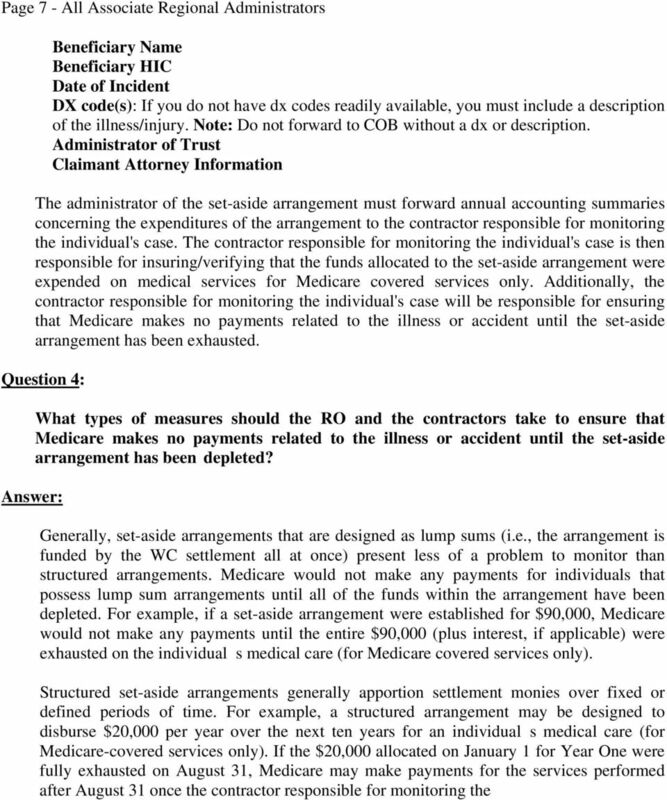 NOTE: Injured individuals who are already Medicare beneficiaries must always consider Page 6 - All Associate Regional Administrators 3 Please note that the review thresholds (i.e., 30 months and $250,000) will be subject to adjustment once CMS has experience reviewing these matters under these instructions. 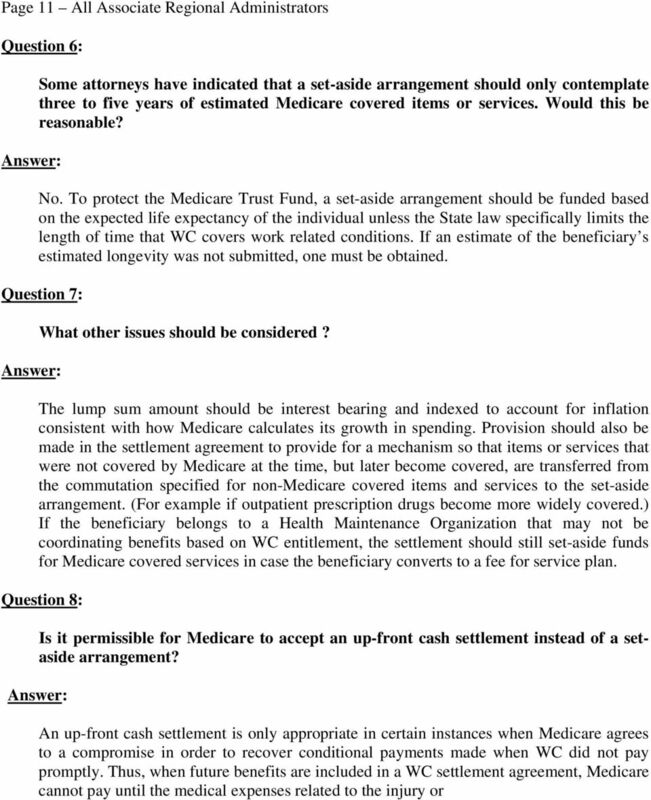 10 Page 10 All Associate Regional Administrators services not covered by Medicare to be based on the beneficiary s life time while the agreement s allocation for services covered by Medicare is based on a lesser time period? What is the State law regarding how long WC is obligated to cover the items or services related to the accident or illness? 9. Is the beneficiary living at home, in a nursing home, or receiving assisted living care, etc. 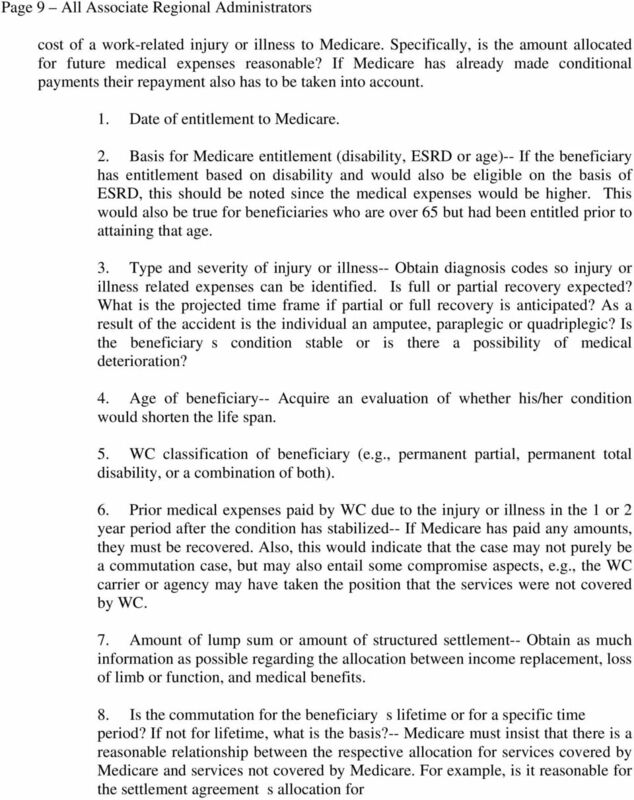 ?-- If the beneficiary is living in a nursing home, or receiving assisted living care, it should be determined who is expected to pay for such care, e.g., WC (for life time or a specified period) from the medical benefits allocation of lump sum settlement, Medicaid, etc. 10. Are the expected expenses for Medicare covered items and services appropriate in light of the beneficiary s condition?-- Estimated medical expenses should include an amount for hospital and/or SNF care during the time period for the commutation of the WC benefit. (Just one hospital stay that is related to the accident could cost $20,000.) For example, a quadriplegic may develop decubitus ulcers requiring possible surgery, urinary tract infections, kidney stones, pneumonia and/or thrombophlebitis. Although each case must be evaluated on its own merits, it may be helpful to ascertain for comparison purposes the average annual amounts of Part A and Part B spending for a disabled person in the appropriate State of residence. Keep in mind that these Fee-for-Service amounts are for all Medicare covered services, while our focus here only deals with services related to the WC accident or illness. 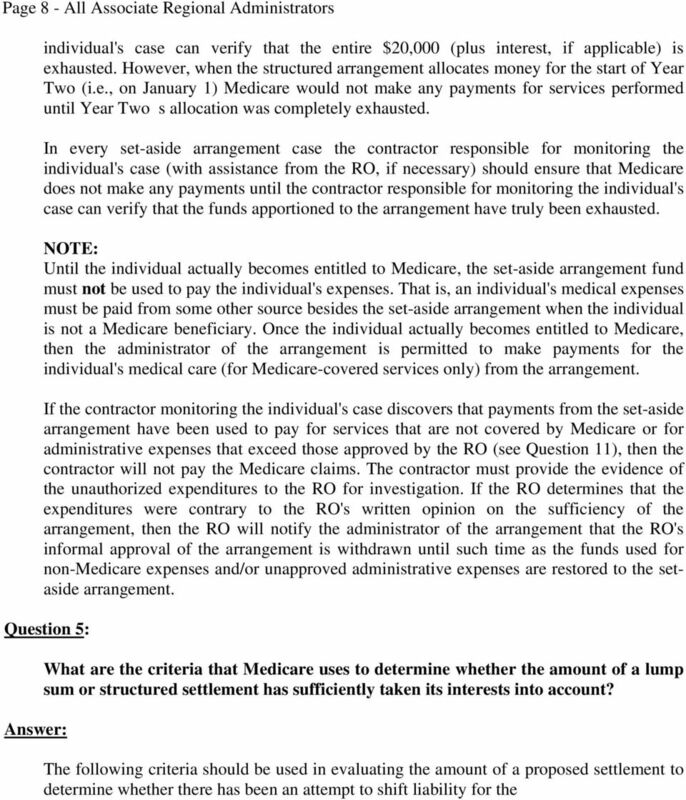 Therefore, the RO should use appropriate judgment and seek input from a medical consultant when determining whether the amount of the lump sum or structured settlement has sufficiently taken Medicare's interests into account. 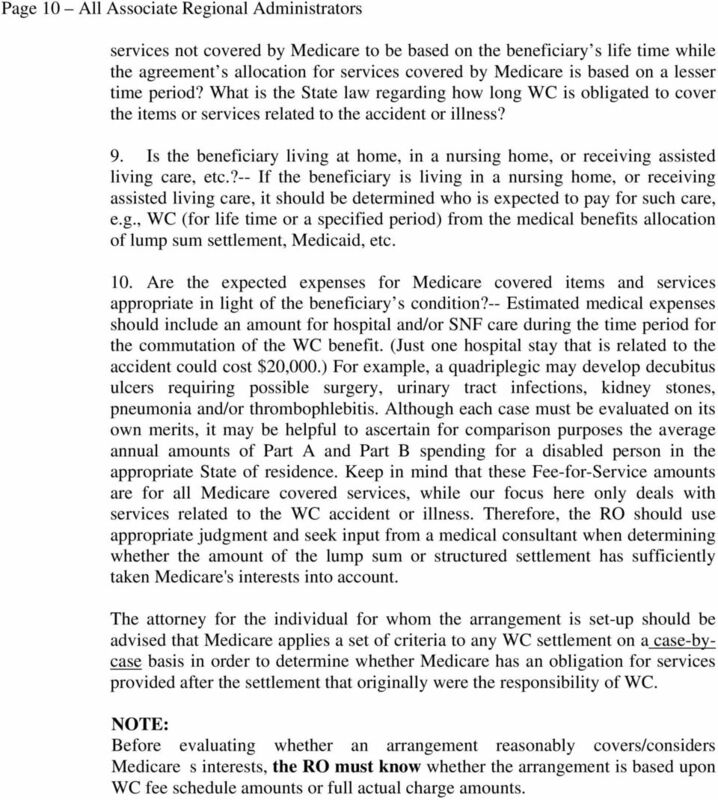 The attorney for the individual for whom the arrangement is set-up should be advised that Medicare applies a set of criteria to any WC settlement on a case-bycase basis in order to determine whether Medicare has an obligation for services provided after the settlement that originally were the responsibility of WC. 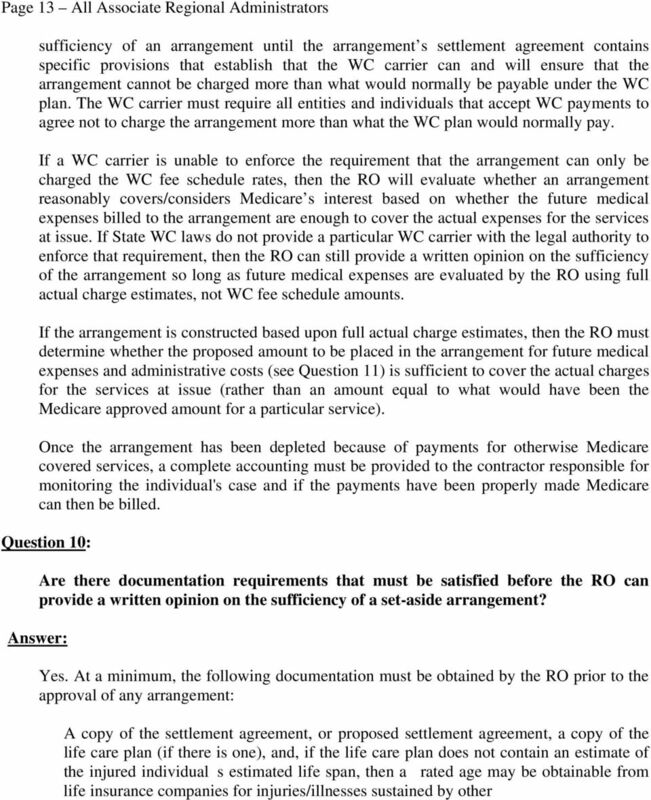 NOTE: Before evaluating whether an arrangement reasonably covers/considers Medicares interests, the RO must know whether the arrangement is based upon WC fee schedule amounts or full actual charge amounts. 14 Page 14 All Associate Regional Administrators similarly situated individuals. Also, documentation which gives the basis for the amounts of projected expenses for Medicare covered services and services not covered by Medicare (this could be a copy of letters from doctors/providers documenting the necessity of continued care). The RO may require additional documentation, if necessary and approved by CO. Question 11: How does the RO determine whether or not the administrative fees and expenses charged to the arrangement are reasonable? Before a proposed arrangement can be approved, the RO must determine whether the administrative fees and expenses to be charged to the arrangement are reasonable. The RO must be notified (in writing) of all proposed administrative fees prior to the RO providing its written assurance that the set-aside arrangement is sufficient to satisfy the requirements of 42 CFR If the administrative fees are determined to be unreasonable, the RO must withhold its approval of the set-aside arrangement. The amount of the approved arrangement must include both the estimated medical expenses plus the amount of administrative fees found to be reasonable. 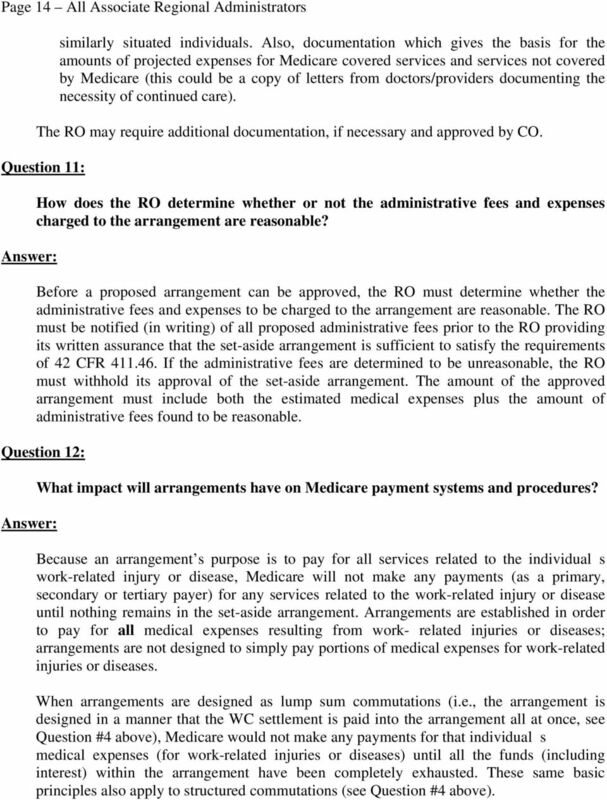 Question 12: What impact will arrangements have on Medicare payment systems and procedures? Because an arrangement s purpose is to pay for all services related to the individuals work-related injury or disease, Medicare will not make any payments (as a primary, secondary or tertiary payer) for any services related to the work-related injury or disease until nothing remains in the set-aside arrangement. Arrangements are established in order to pay for all medical expenses resulting from work- related injuries or diseases; arrangements are not designed to simply pay portions of medical expenses for work-related injuries or diseases. 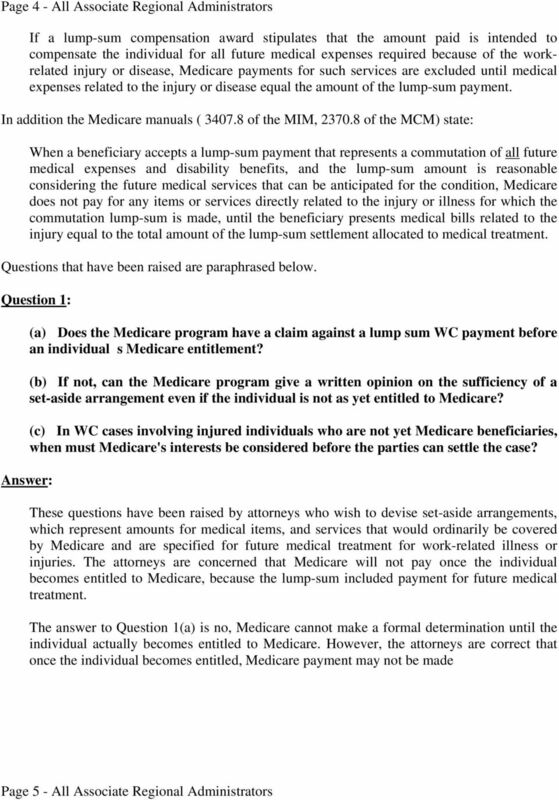 When arrangements are designed as lump sum commutations (i.e., the arrangement is designed in a manner that the WC settlement is paid into the arrangement all at once, see Question #4 above), Medicare would not make any payments for that individuals medical expenses (for work-related injuries or diseases) until all the funds (including interest) within the arrangement have been completely exhausted. These same basic principles also apply to structured commutations (see Question #4 above).